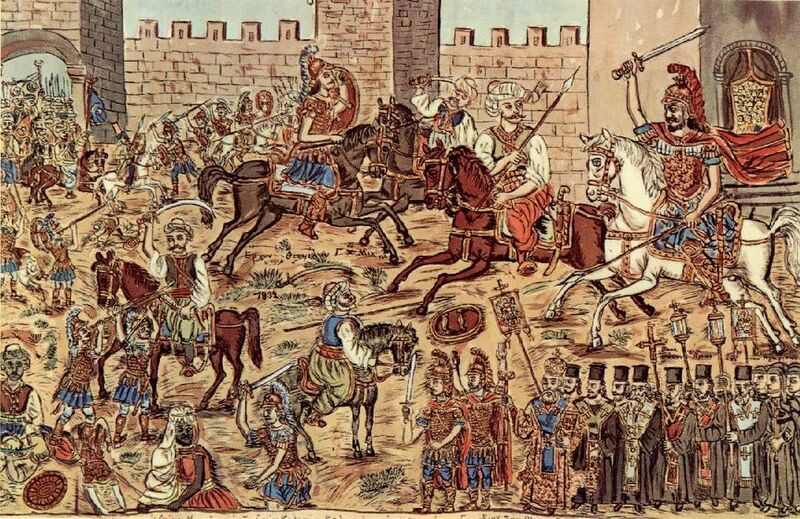 On this date in 1453 Constantinople fell to an invading army of the Ottoman Empire commanded by the 21-year-old Mehmed the Conqueror, the seventh sultan of the Ottoman Empire, defeating emperor Constantine XI Palaiologos. 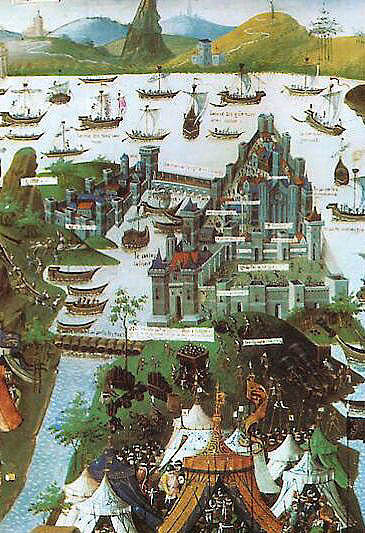 The conquest of Constantinople followed a 53-day siege that had begun on 6 April 1453. The capture of Constantinople (and two other Byzantine splinter territories soon thereafter) marked the end of the Roman Empire, which had existed in one form or another for nearly 1,500 years. The Western half of the Roman Empire fell to invaders in the 5th century, but the Eastern half carried on – sometimes called the Byzantine Empire – until the 15th century. The Ottoman conquest of Constantinople also dealt a massive blow to Christendom, because Muslim Ottoman armies could subsequently advance into Europe without an adversary to their rear. After the conquest, Sultan Mehmed II transferred the capital of the Ottoman Empire from Edirne to Constantinople. For hundreds of years the city was officially called Kostantiniyye (القسطنطيني), but unofficially Mehmed called it Islambol (Islam rules) and eventually became Istanbul. Many histories equate the fall of Constantinople (and the end of the Byzantine Empire) with the end of the Middle Ages, but it’s not as if people living at the time acknowledged that one era had ended an another begun. Things don’t happen that way on the ground. Terms such as “Middle Ages,” “Renaissance,” “Enlightenment” etc. are rubrics used by historians in hindsight for convenience. Nonetheless, big changes were afoot. Constantinople had been an imperial capital since its consecration in 330 under Constantine the Great. 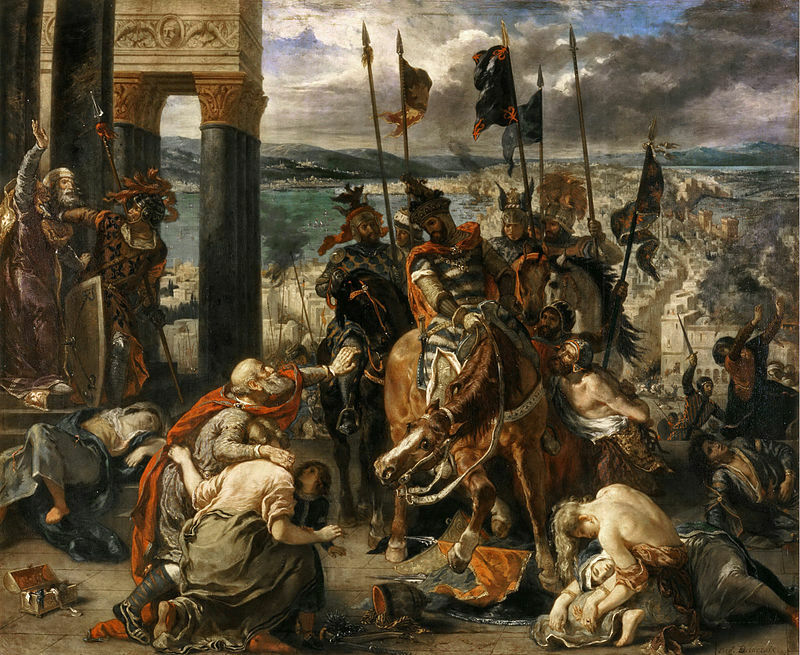 In the following 11 centuries, the city had been besieged many times but was captured only once: during the Fourth Crusade in 1204, an event which further damaged the bad relations between eastern and western Christianity following the Great Schism in 1054, weakened the Byzantine Empire, and one of the major turning points in Western history, still very much alive among members of the Greek Orthodox church. The Fourth Crusade was gathered in 1202 with the intent of capturing Jerusalem by attacking from Egypt, but they were sidetracked by offers of financial help if they would assist the currently deposed emperor. Constantinople had been unstable since the massacre there of the “Latins” (Roman Catholics) in 1182 by orthodox powers. This act increased tensions in the city and worsened relations between Western and Eastern Europe. In 1203 in the midst of violent riots between Greeks and Latins in the city, the newly crowned Alexios IV Angelos was deposed and he appealed to the Crusaders to restore him and quell the city’s problems. The Crusaders laid siege to Constantinople for a year, finally taking it in 1204 and initiating a bloodbath. This unspeakable atrocity of Crusaders against Christians was unprecedented. 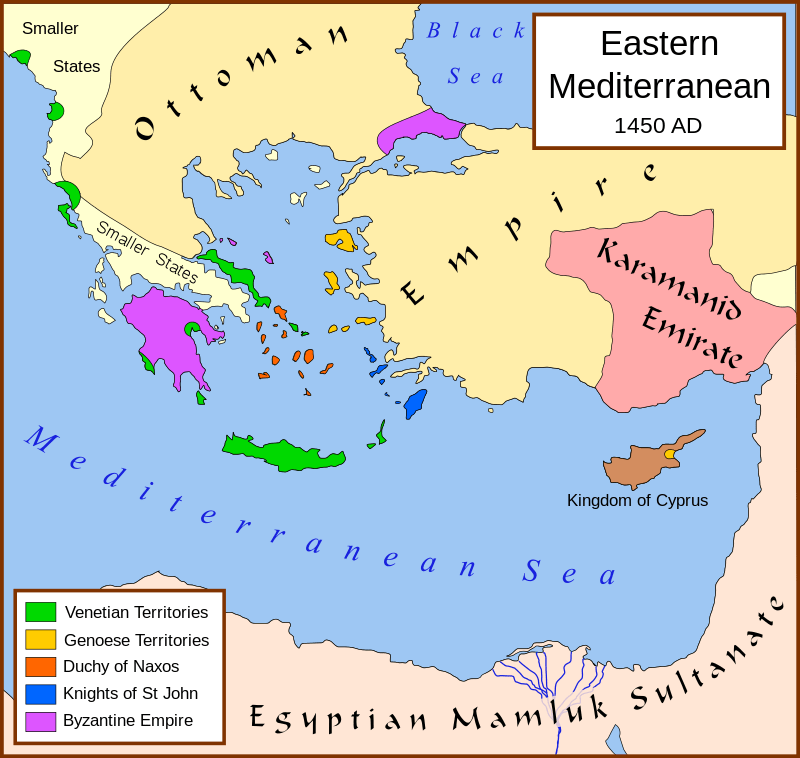 The Crusaders established an unstable Latin state in and around Constantinople while the remaining empire splintered into a number of Byzantine successor states, notably Nicaea, Epirus and Trebizond. They fought as allies against the Latin establishments, but also fought among themselves for the Byzantine throne. The Nicaeans eventually reconquered Constantinople from the Latins in 1261. Thereafter there was little peace for the much-weakened empire as it fended off successive attacks by the Latins, the Serbians, the Bulgarians, and, most importantly, the Ottoman Turks. The Black Plague between 1346 and 1349 killed almost half of the inhabitants of Constantinople. The city was severely depopulated due to the general economic and territorial decline of the empire, and by 1453 consisted of a series of walled villages separated by vast fields encircled by the fifth-century Theodosian walls. By 1450 the empire was exhausted and had shrunk to a few square miles outside the city of Constantinople itself, the Princes’ Islands in the Sea of Marmara, and the Peloponnese with its cultural center at Mystras. The Empire of Trebizond, an independent successor state that formed in the aftermath of the Fourth Crusade, also survived on the coast of the Black Sea. 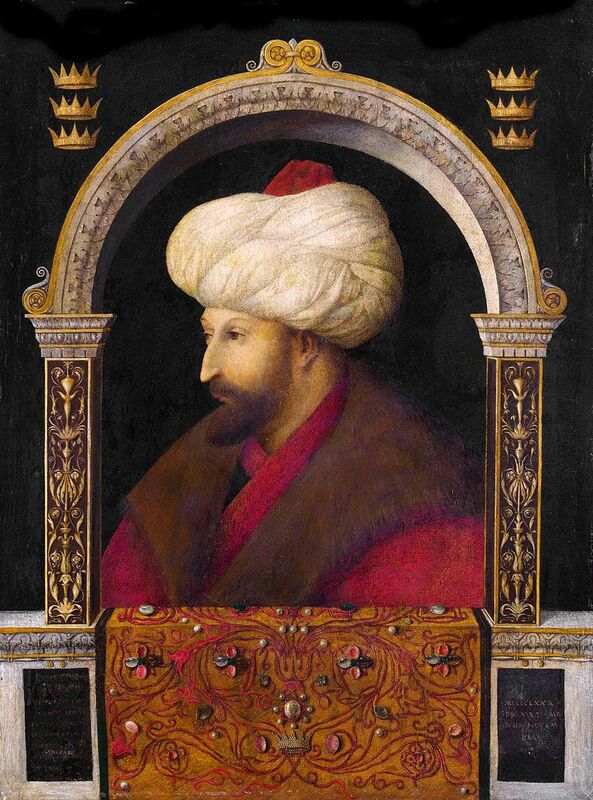 When Sultan Mehmed II succeeded his father in 1451, it was widely believed that the young ruler, then 19 years old, would prove incapable—and that he would pose no great threat to Christian possessions in the Balkans and the Aegean. This optimism was reinforced by friendly assurances made by Mehmed to envoys sent to his new court. But Mehmed’s actions spoke far louder than his mild words. Beginning early in 1452, he built a second Ottoman fortress on the Bosphorus, on the European side several miles north of Constantinople, set directly across the strait from the similar fortress, Anadolu Hisarı, which his great-grandfather Bayezid I had previously built on the Asian side. This pair of fortresses gave the Turks complete control of sea traffic on the Bosphorus; specifically, it prevented help from the north, the Genoese colonies on the Black Sea coast, from reaching Constantinople. (The new fortress was also known as Boğazkesen, which held the dual meanings ‘strait-blocker’ or ‘throat-cutter’, emphasizing its strategic position.) In October 1452, Mehmed ordered Turakhan Beg to lead a large force into the Peloponnese and remain there to keep Thomas and Demetrios from assisting their brother Constantine XI Palaiologos during the impending siege of Constantinople. Byzantine Emperor Constantine XI swiftly understood Mehmed’s true intentions and turned to Western Europe for help; but now the price of centuries of war and enmity between the Eastern and Western churches had to be paid. Since the mutual excommunications of 1054, the Pope in Rome was committed to establishing authority over the Eastern church. Nominal union had been negotiated in 1274, at the Second Council of Lyon, and indeed, some Palaiologoi emperors had since been received into the Latin church. Emperor John VIII Palaiologos had also recently negotiated union with Pope Eugene IV, with the Council of Florence of 1439 proclaiming a Bull of Union. These events, however, stimulated a propaganda initiative by anti-unionist Orthodox partisans in Constantinople; the population, as well as the laity and leadership of the Byzantine Church, became bitterly divided. Latent ethnic hatred between Greeks and Italians, stemming from the events of the Massacre of the Latins in 1182 by the Greeks and the sack of Constantinople in 1204 by the Latins, played a significant role. Finally, the attempted Union failed, greatly annoying Pope Nicholas V and the hierarchy of the Roman church. The army defending Constantinople was relatively small, totaling about 7,000 men, 2,000 of whom were foreigners. At the onset of the siege, probably fewer than 50,000 people were living within the walls, including the refugees from the surrounding area. Turkish commander Dorgano, who was in Constantinople in the pay of the Emperor, was also guarding one of the quarters of the city on the seaward side with the Turks in his pay. These Turks kept loyal to the Emperor and perished in the ensuing battle. The defending army’s Genoese corps were well trained and equipped, while the rest of the army consisted of small numbers of well-trained soldiers, armed civilians, sailors and volunteer forces from foreign communities, and finally monks. The garrison used a few small-caliber artillery bullets, which nonetheless proved ineffective. The rest of the city repaired walls, stood guard on observation posts, collected and distributed food provisions, and collected gold and silver objects from churches to melt down into coins to pay the foreign soldiers. The Ottomans had a much larger force. Recent studies and Ottoman archival data state that there were about 50,000–80,000 Ottoman soldiers including between 5,000 and 10,000 Janissaries, an elite infantry corps, and thousands of Christian troops, notably 1,500 Serbian cavalry that the Serbian lord Đurađ Branković was forced to supply as part of his obligation to the Ottoman sultan—just a few months before, he had supplied the money for the reconstruction of the walls of Constantinople. Contemporaneous Western witnesses of the siege, who tend to exaggerate the military power of the Sultan, provide disparate and higher numbers ranging from 160,000 to 200,000 and to 300,000. 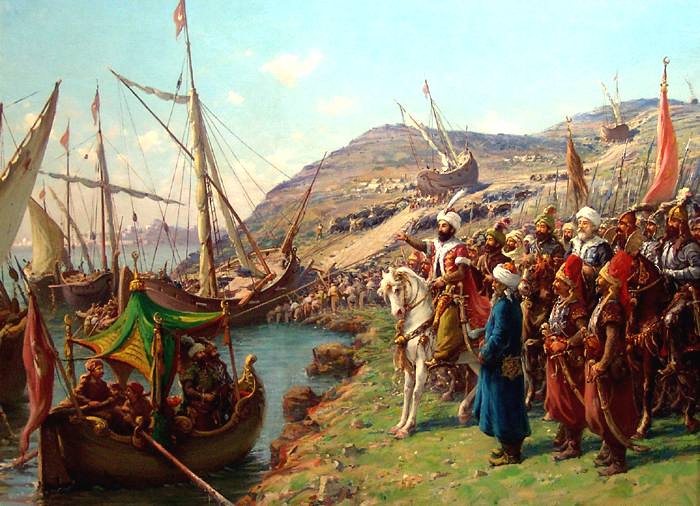 Mehmed built a fleet to besiege the city from the sea (partially manned by Greek sailors from Gallipoli). Contemporary estimates of the strength of the Ottoman fleet span between about 100 ships to 430. A more realistic modern estimate suggests a fleet strength of 126 ships comprising 6 large galleys, 10 ordinary galleys, 15 smaller galleys, 75 large rowing boats, and 20 horse-transports. Before the siege of Constantinople, it was known that the Ottomans had the ability to cast medium-sized cannons, but the range of some pieces they were able to field far surpassed the defenders’ expectations. Instrumental to this Ottoman advancement in arms production was a somewhat mysterious figure by the name of Orban (Urban), a Hungarian (though some suggest he was German). 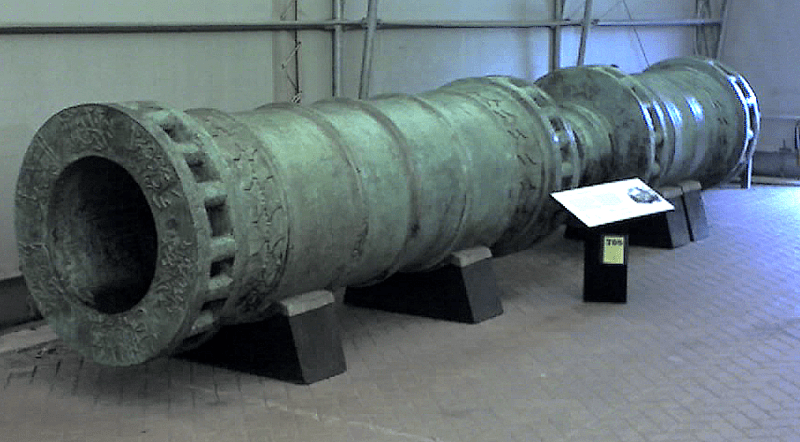 One cannon designed by Orban was named “Basilica” and was 27 feet (8.2 m) long, and able to hurl a 600 lb (272 kg) stone ball over a mile (1.6 km). The master founder initially tried to sell his services to the Byzantines, who were unable to secure the funds needed to hire him. Orban then left Constantinople and approached Mehmed II, claiming that his weapon could blast ‘the walls of Babylon itself’. Given abundant funds and materials, the Hungarian engineer built the gun within three months at Edirne, from which it was dragged by sixty oxen to Constantinople. In the meantime, Orban also produced other cannons for the Turkish siege forces. Orban’s cannon had several drawbacks: it took three hours to reload; cannonballs were in very short supply; and the cannon is said to have collapsed under its own recoil after six weeks (this is disputed, however, reported only in the letter of Archbishop Leonardo di Chio and in the later and often unreliable Russian chronicle of Nestor Iskander). Having previously established a large foundry about 150 miles (240 km) away, Mehmed now had to undergo the painstaking process of transporting his massive artillery pieces. Orban’s giant cannon was said to have been accompanied by a crew of 60 oxen and over 400 men. The city had about 20 km of land walls: 5.5 km; sea walls along the Golden Horn: 7 km; sea walls along the Sea of Marmara: 7.5 km), one of the strongest sets of fortified walls in existence. The walls had recently been repaired (under John VIII) and were in fairly good shape, giving the defenders sufficient reason to believe that they could hold out until help from the West arrived. In addition, the defenders were relatively well-equipped with a fleet of 26 ships: 5 from Genoa, 5 from Venice, 3 from Venetian Crete, 1 from Ancona, 1 from Aragon, 1 from France, and about 10 Byzantine. 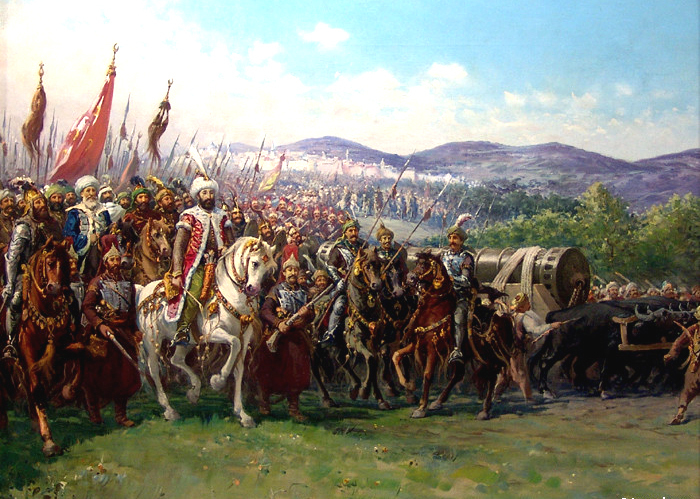 On 5 April, the Sultan himself arrived with his last troops, and the defenders took up their positions. As their numbers were insufficient to occupy the walls in their entirety, the Byzantines decided to man the outer walls only. You can read all about the siege and fall of Constantinople if you wish. One should not assume, using hindsight, that the doom of Constantinople was inevitable. It was an exceptionally well defended city, so that even against a powerful army, fleet, and siege weapons, the fall of Constantinople was not a foregone conclusion. A few events broke the wrong way, however, and that sealed the city’s fate. It’s not overstating the case to say that the effects of the fall of Constantinople still reverberate today. If nothing else, it should be a stern warning that enmity between Christians and Muslims in Europe is scarcely new, and contemporary feuds of longstanding are not going to go away because of a few political speeches filled with platitudes. Nowhere is the paradox of the tension between Greek and Turk more evident than in their respective cuisines: by and large they are THE SAME. I defy you to taste Turkish Delight and Greek Delight blindfolded and tell me which is which, though each side claims theirs is uniquely their own. Do the same with dolmadas (stuffed grape leaves), or 100 other specialties. 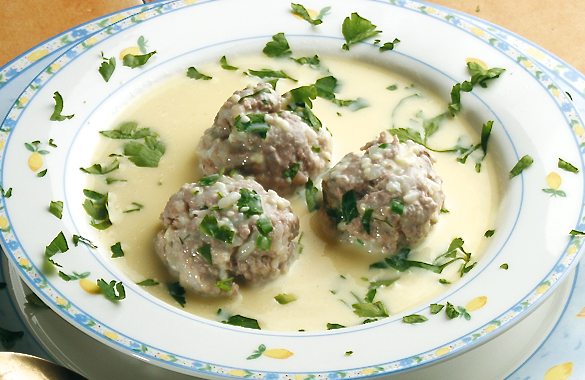 Yuvarelakia is a lamb meatball dish known in Byzantine times, and still popular in both Greece and Turkey. Combine lamb, grated onion, chopped garlic, barley flour, chopped parsley, fresh mint (or basil), dried oregano, salt and the slightly beaten egg. Mix well. Shape into walnut-sized meatballs and set aside. Bring the 5 cups of stock to a boil with the chopped onion, celery, and carrot. Add salt to taste. Add the meatballs and simmer, covered, for 30 minutes. In a medium bowl beat together the lemon juice and egg yolks. Carefully add 1 cup of stock to the lemon-egg mixture, a little at a time, whisking constantly. When they are completely blended add back to the soup, stir, heat through gently and serve.